Your indoor air quality can have a major effect on your health and that of your family. How clean is the air in your home? You may not give it much thought, but something that seems so insignificant can actually cause some serious health issues. But how can you tell if your air quality is good or bad? And if it’s bad, what can be done about it? The good news is that air quality issues are usually easy to fix with basic HVAC maintenance in Burlington. Here are some signs that may indicate your indoor air quality isn’t optimal. New or Worsening Allergy Symptoms. 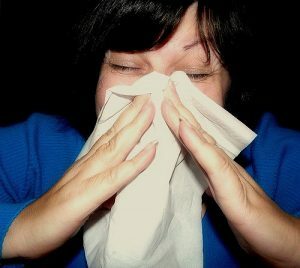 If you suffer from allergies, whether seasonal or otherwise, you may notice that your symptoms have worsened recently. If you’ve never had allergies before, but recently you have begun to sneeze, have itchy or watery eyes, a scratchy throat, or a cough that doesn’t seem to be related to a cold or other illness, your indoor air may be to blame. Allergens such as pollen, dust, and pet dander can get through filters, in some cases because they are dirty, and blow around your home through your HVAC system. Mold is another type of allergen that can form due to excess moisture. New mold growth can cause allergies for some who don’t normally suffer from allergies. Serious Health Concerns. Beyond just typical allergy symptoms, poor indoor air quality can cause more serious health concerns. Headaches, fever, nausea, asthma, and even some root causes of pneumonia can be the result of prolonged exposure to poor air quality. Unusual Smell in the Air. If the air in your home smells musty or odd, and it doesn’t seem to be due to any other culprit (like trash or pets), you may have an issue with your HVAC system. A musty smell is most likely due to mold or mildew growth in your system or ducts. Other strange odors could be due to any number of issues with your AC or furnace and are best diagnosed by your HVAC technician. Dirt Collected On or Around Air Vents. If you think you may have an indoor air quality issue, walk through your home and inspect your air vents. If you notice dirt, dust, or soot collected around or directly on the vents, it’s safe to assume that the air isn’t very clean. If you notice any of these signs, you should contact your heating and cooling company as soon as possible. When your family’s health is at stake, there is no time to waste. There’s a good chance that all your system needs is a good tune-up. HVAC maintenance in Burlington from Alamance Oil is not only affordable, but it will save you money in a variety of ways. When your system is well maintained, it runs more efficiently, lowering your monthly energy bill. Regular maintenance also keeps your HVAC system running well for many years longer than an unmaintained system, meaning your system will last much longer. Keep your indoor air cleaner, saving you money and protecting your family from allergies and other health issues that stem from poor indoor air quality. Call (336) 226-9371 to schedule an appointment with Alamance Oil today.